The impasse in forming a government in Germany has dragged on since election day, September 24th – often like a traffic gridlock, hardly moving forward. But Germany is Europe’s main central power – and with no proper government! Angela Merkel still acts as boss, the old ruling cabinet holds on as caretakers, but it’s all on borrowed time, with no legitimacy. This old cabinet was called a “Grand Coalition”, with the biggest parties, former foes, joining to form it. Five ministers were from Merkel’s Christian Democratic Union (CDU) and two from its purely Bavarian sibling, the Christian Social Union (CSU). The two usually stick together to form the “Union” (the word has nothing to do with labor unions in German). Counting Chancellor Merkel that makes eight while the junior partner, the Social Democrats (SPD), hold five cabinet ministries. All three did miserably in the election, but since the Union remained the strongest, Merkel is the one to form a new government – if she can! But the SPD lost so miserably – down to 20.5 % – that Martin Schulz, its leader, declared bluntly: “Never again will we be junior partners in a Grand Coalition. We will again become an opposition party until we can rebuild our strength”. But his SPD may well have to swallow those words, and his position may get swallowed up as well! The problem is that a majority of delegates in the Bundestag is needed to pass laws or actions the government decides upon. With only two parties this would be easy; winner takes all! With one more, a smaller third party can choose which big one it favors and tip the seesaw in that direction. 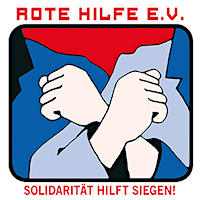 For years this tilting element was the Free Democratic Party (FDP), a strange “libertarian” party founded by both civil rights liberals and former Nazis, but now basically a secular big business party fighting against both environmental or workers’ rights restrictions and regulations. In 1983 the Greens squeezed past the required 5% minimum to win seats in the Bundestag. They were a pretty radical bunch then, reflecting a giant West German peace movement which led over a million people on one day (with many labor unions) in demonstrations against stationing missiles in Germany. Those first Green deputies resembled the American SDS, defied conservative traditions, wearing and even knitting wool sweaters during Bundestag sessions and in one case wearing sneakers to a swearing-in ceremony (and having more than 50 % female delegates). With four factors in the Bundestag, a balance was possible: one side was a so-called “center-right” with the twin “Christian Union” plus the FDP. Opposing them was what some called a “center-left”. The SPD kept its union ties but the leaders of both were mostly well-off and tame. As for the Greens, after German unification former dissident groups from the defunct German Democratic Republic joined them and pushed them rightward. They still stressed ecology and were good on gay rights, immigrants and equality for women. But on foreign policy they became the most belligerent of all, and they had almost no contacts with working class folk, who rarely voted for what became a party of well-off intellectuals. But it could help form governments; the Greens and the SPD alternated with the Union and FDP. Then the LINKE party entered the picture (at first under an earlier name). Though at first no others wanted to have anything to do with them and they are still only partially accepted as ”decent democratic citizens”, their very presence, now with 69 seats (out of a total 709) made it harder to find over half the seats and form any coalition. In 2013 this made it necessary for the two biggest parties, the CDU and the SPD, to overcome old-time differences and form the coalition described above. Since both had moved closer politically this was not quite so difficult – for the leaders. But both lost big chunks of their voters, thus landing them in the current quagmire – with the SPD “No”. To make matters worse in every way, the far-right, Nazi-tinged Alternative for Germany (AfD) soared to 12.6 % of the vote, getting them 94 deputy seats, some ripe to be adorned with swastikas. No-one would coalesce with them either (as yet? ), but their very number made it harder than ever – now with seven parties – to reach that 50% level. To make it, with the Social Democrats proudly resisting a renewed Grand Coalition, Merkel’s Siamese-twin Union parties (with only 246 seats) needed both the Free Democrats and the Greens, who hated each other. But she tried to lure the two onto the ship of state, so the four parties negotiated, bargained, argued, made compromises, rejected them, insulted each other and withdrew the insults, talked and talked for weeks and weeks. As Angela Merkel’s final deadline arrived it seemed they had at last swallowed their differences, with the Greens, the smallest, making the most compromises on its remaining principles. Then suddenly, at the last moment, the head of the Free Democrats called a press conference to say that his party was bowing out. No deal! All hopes for a “Jamaica government” – with party colors like those of the flag of far-off Jamaica, black, green and yellow – were now shattered. Three possibilities remained. One was a minority government, hitherto unknown on the federal level, with the chances of passing any law or decision dependent on which non-government parties would agree to support it. Angela Merkel rejected this out of hand; she wanted no unstable force, open to pro or con pressures on her plans for Europe and beyond. And new elections? Nobody wanted them; they could end up much the same as the September vote or perhaps bring more gains for an opponent. Worst of all, they might well wind up with even bigger gains for the fascistic AfD, disgracing Germany’s image in all the world. The third possibility is for the Social Democrats to swallow their pride and their brash words and slink back in again with the Merkel crowd as junior partners. Left-leaning Social Democrats, especially their Young Socialist wing, opposed such a compromise. But then Germany’s otherwise figure-head President Frank-Walter Steinmeier, himself an SPD man, urged his old fellow members to weaken up and come to the rescue of Germany. At the moment this seems the most likely outcome. And the president was happy to find, at last, some role other than just cutting ribbons, shaking hands and making speeches. Yes, the SPD will probably eat crow “for the good of the nation”, with a return to the “same old same old” of the past four years. There will be quarrels. One courageous woman, the Minister of Environment, a Social Democrat, opposed further use of Monsanto’s herbicide Glyphosat in the European Union. But the Minister of Agriculture, from the Bavarian CSU, went to Brussels and defied her decision, breaking the rules to vote Yes on Glyphosat. Was that on his own or with Merkel’s OK? (And Monsanto pressure?) It’s not known, but it was a bad start by these care-taker ministers even before any new coalition had been agreed upon; no good omen for a possible new cabinet made up of the same parties and perhaps the same ministers. Will the Social Democrats voice valiant words about favoring progressive policies and then once more be satisfied with a few ripples while going along with the conservative tide of Merkel and the toughies behind her? The LINKE party, with its 64 Bundestag deputies (a majority are women), was never asked and rarely mentioned in all this Ring-around-the-Rosie politics. Although some in the party do dream of someday being asked to join a coalition, this idea was never even vaguely broached by Merkel. And yet, the LINKE remains the only single political factor with principle and conscience. Yes, the Greens (and that one SPD cabinet minister) did hit at environmental issues, but other basic issues were hardly even mentioned. German soldiers are killing and dying in Afghanistan and Mali – and will soon march into Niger. Tanks and troops of the Bundeswehr are maneuvering dangerously near St. Petersburg on the Russian border. The Minister of Defense has set her sights on a super-modern European army with Germany leading the pack. No other party seems worried, all bow down to media anti-Russian attacks all too reminiscent of eighty years ago while the result of that policy then, the defusing of rusted old bombs, is still forcing people to leave their homes for hours, day or night. Too many are forced to leave their homes more permanently. Görlitz on the Polish border, untouched by the war and called by many the prettiest town in Germany, was told last week that Siemens factories there and in Leipzig are planning to close and to cut jobs in Erfurt and Berlin. In out-of-the way Görlitz this is one of the last two job chances, and the Bombardier railway car factory, the other, is hinting at following suit. Thousands have already left the wilting town. While the LINKE has sadly been unable to reach enough working class people – its vote is about 15% – the AfD got 32.7%, making it the leading party in Görlitz as well as in all of Saxony. Although its program favors forces like Siemens, which is raking in more billions than ever, its clever propaganda, full of hatred, mostly against refugees and often helped by the media, is all too effective, although there are only 157 refugee families in Görlitz. Too many people, faced with such shut-downs, with low-paid, increasingly uncertain but overworked jobs, few chances for their offspring and worries about their retirement, are led to fear invented, non-existent threats like “Islam” instead of real threats from real foes. Merkel still boasts of how good things are going, but her pleasant smiles are increasingly unconvincing. Unless ways are found to reach large numbers of the worried and dissatisfied, the menaces facing Germany – and perhaps world neighbors, near and far, will hardly be dispelled even if Social Democrats and the Christian Union parties now find their way to a renewed coalition. Hier beschreibe ich das Unwesen von Zielvereinbarungen und das Unterlaufen arbeitsrechtlicher Standards durch die Vereinbarung „gemeinsamer Ziele“ von Arbeitgebern und Arbeitnehmern in Mitarbeitergesprächen. Ferner das Ausländerrecht der Bundesrepublik Deutschland, einschließlich des Niederlassungsrechts und des Asylrechts. Ich bin Fachanwalt für Arbeitsrecht aber auch Autor auf diversen Gebieten, nicht nur des Arbeitsrechts. Zugleich bin ich Referent auf arbeitsrechtlichen Fortbildungsveranstaltungen unterschiedlicher Bildungsträger und Lehrbeauftragter an der Universität Oldenburg. Druckerei weigert sich für AfD zu drucken! Die AfD ist keine normale Partei im politischen Spektrum, wie spätestens mit dem gestrigen Parteitag noch einmal gezeigt hat. Die rassistischen und rechten Positionierungen der AfD machen sich dabei auch im Alltag bemerkbar, wie der AfD Abgeordnete Jörg Nobis vor wenigen Tagen merkte. 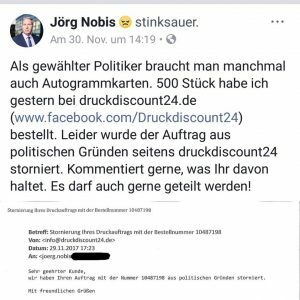 Als er Autogrammkarten drucken lassen wollte, hatte er wohl nicht damit gerechnet, dass diese ihm nicht geliefert werden, doch die Kölner Druckerei Druckdiscount24 lehnte den Druck ab, aus politischen Gründen. Auch unter denjenigen, die Nobis Post teilten, war ein großer Teil, der sich über ihn lustig machte, so postete Jan Böhmermann: „Aus Ehrenfeld nach Bocklemünd: ❤️✊? für Druckdiscount24!“. Auch auf Twitter machte der Beitrag die Runde und dutzende Menschen kommentierten, dass sie nun eine neue Druckerei des Vertrauens hätten. Erstveröffentlichung in „Die Freiheitsliebe“ vom 3. Dezember 2017. Über den Autor: Ich habe 2009 die Freiheitsliebe gegründet aus dem Wunsch, einen Ort zu schaffen, wo es keine Grenzen gibt zwischen Menschen. Einen Ort an dem man sich mitteilen kann, unabhängig von Religion, Herkunft, sexuelle Orientierung und Geschlecht. Freiheit bedeutet immer die Freiheit von Ausbeutung. Als Autor dieser Webseite streite ich für eine Gesellschaft, in der nicht mehr die Mehrheit der Menschen das Umsetzen muss, was nur dem Wohlstand einiger Weniger dient. Ihr findet mich auf: Facebook. War da nicht noch was? Der dritte Ausstellungsraum im Filmhaus am Potsdamer Platz bietet einen Blick in die Zukunft des Kinos. Dafür muss man allerdings unförmige Brillen aufsetzen. Man kann sich damit an einem 20er-Jahre-Filmset in Florida umschauen, 360 Grad, Herbert Knaup spielt in dem volumetrischen Dreiminüter einen Regisseur alten Stils. Die Universum-Film AG (UFA) ist in den hundert Jahren seit ihrer Gründung Ende 1917 jung geblieben, will die Schau zum Jubiläum in Berlin einem mitgeben. Als die UFA zu ihrem 75. mit einer großen Ausstellung im Berliner Zeughaus gefeiert wurde, kamen Stars früherer Jahrzehnte, Dolly Haas aus den USA, in die sie in den 30ern emigriert war, und ich erinnere mich an die ungleichen Schwestern Camilla und Steffie Spira. Zum 100. ist alles eine Nummer kleiner, von der Ausstellungsfläche im Museum für Film und Fernsehen bis zur Zahl der Promis bei der Eröffnungsfeier am vergangenen Freitag. Nicht einmal als heutige UFA-Stars in der Ausstellung herausgehobene Schauspieler wie Dieter Hallervorden, Heino Ferch oder Claudia Michelsen ließen sich blicken. Wenigstens die Regisseure Philipp Stölzl (»Der Medicus«), Roland Suso Richter (»Ein starkes Team«) und Nico Hofmann erschienen, letzterer in seiner Eigenschaft als Geschäftsführer der UFA GmbH. Genauer genommen besteht die UFA noch keine 100 Jahre, denn 1945 wurde sie von den Alliierten liquidiert und kam erst mehr als zehn Jahre später als Neugründung wieder mehr schlecht als recht auf die Beine. Warum wird überhaupt gefeiert? Das sagt der Untertitel der Schau, »Geschichte einer Marke«. Der heutigen UFA, Hauptsponsor der Ausstellung, geht es um Steigerung ihres Markenwertes, wobei ihr an der eigenen Geschichte nicht alles gefällt. Das historische Logo mit der Raute sollte möglichst selten vorkommen, keine leichte Aufgabe für Kuratorin Klaudia Wick bei ihrer ersten Ausstellung an diesem Haus! Sie hat das im ersten, teils schlauchartigen Raum so gelöst, dass an einer Wand Objekte der alten UFA zu sehen sind, beginnend mit der Stummfilmzeit: Originalplakate, Fotos, Preistrophäen, Briefe und Tagebücher in Vitrinen, originale Kostüme der in ihren politischen Ansichten grundverschiedenen Diven Marlene Dietrich und Zarah Leander. An der gegenüberliegenden Wand wird die UFA der vergangenen sechs Jahrzehnte mit der Betonung auf Fernsehfilme und -shows präsentiert. So mancher wird bei Hinweisen auf TV-Serien wie »Danni Lowinski« oder »Verbotene Liebe« erstaunt sein, dass auch dies UFA-Produktionen sind. Erst recht gilt das wohl für TV-Shows wie »Das Supertalent« oder »Deutschland sucht den Superstar«. 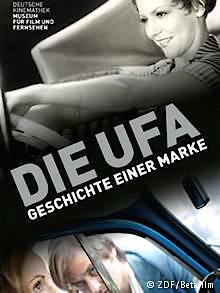 Zwischendurch wird stolz darauf verwiesen, dass die UFA gewissermaßen verkappte DEFA-Filme produziert hat. Tatsächlich konnte sie ehemalige DDR-Künstler wie Manfred Krug, Frank Beyer und Jurek Becker verpflichten. Aber war da nicht noch was? Wurde die UFA nicht mitten im Ersten Weltkrieg von Reichswehr und Deutscher Bank gegründet und mitten im Zweiten Weltkrieg in Reichseigentum überführt? War nicht auch bei der Reprivatisierung durch den Rechtsnachfolger BRD 1956 die Deutsche Bank führend? Und welche Gründe hatte der Verkauf ihrer Anteile acht Jahre später – nunmehr im Kalten Krieg – an die Familie Mohn (Bertelsmann)? Die Unternehmensgeschichte der 20er bis 40er Jahre wird von den heutigen UFA-Besitzern nicht ohne Grund als schmuddelig empfunden. Tatsächlich produzierte die UFA nicht nur formal und technisch Beispielhaftes wie Fritz Langs »Metropolis« (mit einer fatalen Botschaft), sondern bereitete mit den Fridericus-Rex-Filmen schon in den 20er Jahren das geistige Klima für den Faschismus vor. Später waren die perfiden großen Propagandaschinken der Nazis von »Jud Süß« bis »Kolberg« UFA-Produktionen. Sie werden in der Ausstellung nicht unterschlagen, sind Teil der großen Buntheit, mit der die UFA zwischen Tonfilmoperette und Melodram aufwartet. Die eine oder andere Auskunft über die politischen Dimensionen erhält, wer sich an Monitoren durch Menüs klickt. Im zweiten Raum gibt es eine Reihe von Sichtungsplätzen, an denen man ganze Filme einschließlich ausführlicher Dokumentationen sehen kann. Die Zeit nimmt sich nicht jeder Besucher. Aufschlussreicher als die Ausstellung sind zwei Bücher, die aus ihrem Anlass erschienen sind. Der offizielle, reich bebilderte Katalog geht der UFA-Geschichte akribisch nach, wenngleich auch hier einige Themen, wie etwa die filmische Preußen-Beweihräucherung in der Weimarer Republik zu kurz kommen. Der Film der Weimarer Republik werde in der Berlinale-Retrospektive im Februar eine Rolle spielen, so Kinemathek-Chef Rainer Rother auf der Pressekonferenz vorige Woche. Die Zeit des Faschismus wird im Sammelband »Linientreu und populär« eingehend behandelt. 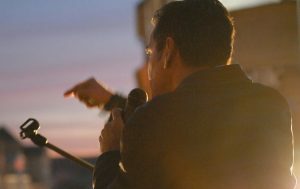 Rother kommentiert Dokumente des Konzerns, Friedemann Beyer erörtert die Vorbereitung auf den NS-Film in der Ära Hugenberg, Kay Hoffman lässt dem unterschätzten »Kulturfilm« aus dem Vorprogramm Gerechtigkeit widerfahren. 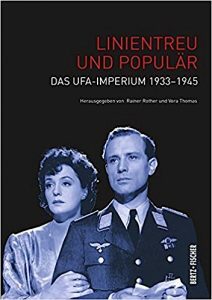 Was den Leser aufrüttelt, sind die Beiträge von Almuth Püschel und Jens Westemeier zu einem unterbelichteten Kapitel der UFA-Geschichte, dem Einsatz von Zwangsarbeitern. 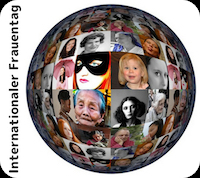 Menschen aus den besetzten Gebieten, oft Frauen und Kinder, wurden in Deutschland von der Filmgesellschaft ausgebeutet. Die Zwangsarbeiter aus der Sowjetunion lebten als rassisch minderwertig eingestuft unter besonders unmenschlichen Umständen. Püschel schildert das Beispiel einer Frau, deren zwei Kinder das Arbeitslager nicht überlebten. Westemeier stellt detailliert den Weg eines niederländischen Zwangsarbeiters bei der UFA-Propagandaabteilung dar. Dieses Thema kommt in der Ausstellung zu kurz. Das Schriftsteller-Ehepaar Klaus und Aljonna Möckel war auf vielen Gebieten erfolgreich, etwa mit zwei Büchern über ihren Sohn Dan (vgl. Nr. 16/2016) oder die unter dem gemeinsamen Pseudonym Nikolai Bachnow geschriebenen acht Fortsetzungsbände zu Wolkows „Zauberer der Smaragdenstadt“. Der Name Bachnow verweist auf Aljonnas Mädchennamen Bach. Jetzt haben Möckels gemeinsam eine Broschüre über Aljonnas Vater Erwin Johannes Bach im Zeichen seines 120. Geburtstages im Oktober herausgegeben. Er starb 1961. 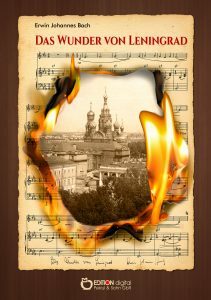 Der Musiktheoretiker, Komponist und Schriftsteller Bach ist mit seiner einzig erhaltenen Sinfonie „Ruf an die Menschheit“, von ihm als „Sinfonisches Fresko“ bezeichnet, uraufgeführt vor einem Jahr in seiner Geburtsstadt Hildesheim, wieder in den Blickpunkt einer interessierten Öffentlichkeit gerückt. Die Erlebnisse im Ersten Weltkrieg ließen den Juden zum Kommunisten werden. Als junger Mann verfasste er sein theoretisches Hauptwerk „Die vollendete Klaviertechnik“, das in mehrere Sprachen übersetzt wurde. Vor den Nazis floh er 1933 in das „Heimatland der Werktätigen“, die Sowjetunion, die neben Ehre für seine Arbeit als Musikprofessor auch viele Enttäuschungen im Zeichen der stalinschen Säuberungen bereithielt. Die schwersten Monate verlebte er mit seiner Familie nach dem deutschen Überfall auf die Sowjetunion im belagerten Leningrad, wo 1941 auch seine Tochter Aljonna zur Welt kam. Als er nach dem Krieg in der DDR lebte, schrieb er darüber den einerseits erschütternden, im Grundton aber optimistischen Text „Das Wunder von Leningrad“. Er ist das Zentrum des schmalen Bandes, der im Vorwort von Bachs verschlungenem Schicksalsweg von Deutschland in die Sowjetunion und wieder zurück erzählt, und im Anhang anhand von Briefen und anderen Dokumenten von seiner Arbeit und der kollegialen Freundschaft mit dem Komponisten Dmitri Schostakowitsch und dem Dirigenten Zoltan Fekete. Auch jüngere Forschungsarbeiten zu Bachs musikalischem Werk werden hier kurz angerissen. 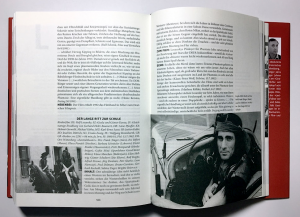 Doch sowohl Bachs Lebensweg als auch seine Arbeit als Autor und Übersetzer sind so spannend, dass der Wunsch offen bleibt, die Möckels würden die Kraft und wohl auch einen interessierten Verlag finden, ein Erwin Johannes Bach-Lesebuch zu veröffentlichen, das Aufschluss über das ruhelose Künstlerleben eines Linken im 20. Jahrhundert geben würde. Endlich wieder mal eine satirisch angehauchte Klamotte aus der Schweiz! Der Titel „Flitzer“ führt keineswegs zum Autorennen, sondern zu den berüchtigten Nackten, die Sportveranstaltungen stören – oder ihnen erst den richtigen Pep geben. Einem Lehrer kommen die anvertrauten Gelder für einen Sportplatz abhanden, und er kommt auf eine neue Wett-Idee: Wie lange kann sich ein Flitzer auf dem Rasen halten, bevor er vom Ordnungspersonal überwältigt wird? Die Spekulanten fahren auf diese Idee ab. Der Lehrer organisiert alles professionell, bis er fast an einer von einer Frau geführten Sonderkommission scheitert. Der Komiker Beat Schlatter hatte die umwerfende Idee und spielt selbst die Hauptrolle unter der Regie von Peter Luisi. Zusammen schufen sie einen amüsanten Familienfilm – ja, Familienfilm, denn Genitalien sind immer nur kurz zu sehen, und Kinder lernen ganz leicht, dass Nackte nicht peinlich sein müssen. Flitzer, Regie: Peter Luisi, Schweizerdeutsch mit dt. UT, X-Verleih, seit 16.11. in ausgewählten Kinos. Gestern wurde im Kino Toni, am Berliner Antonplatz, die stark erweiterte Auflage, des schon bekannten, Lexikons der DEFA Spielfilme vorgestellt. Kurz nach dem 70. Jubiläum der DEFA (Deutsche Film AG) hat der Autor und renommierte Filmpublizist Frank-Burkhard Habel sein, nun stark illustriertes Werk, der Öffentlichkeit präsentiert. Es entstand, 16 Jahre nach Erscheinen der ersten Ausgabe, in enger Zusammenarbeit mit der DEFA-Stiftung. Im Gespräch mit der Schauspielerin Ute Lubosch sagte F.-B. Habel unter anderem: »DEFA war mehr als die populäre Abkürzung des Namens einer Filmgesellschaft. DEFA-Filme waren Programm und Propaganda, standen oft für Qualität und manchmal für Qual«. Anschließend wurde der Kurzfilm »DEFA 70« gezeigt, den der durch Konrad Wolfs Filme bekannte Kameramann Werner Bergmann 1965 als sein Regie-Experiment gedreht hatte, um die Möglichkeiten der 70 mm-Kamera auszutesten. Vor dem interessierten Publikum, darunter Künstler aus DEFA-Zeiten, wie die Schauspielerinnen Dietlinde Greiff und Katrin Knappe, die Dramaturgin Inge Heym, der Kameramann Peter Ziesche und die Szenenbildnerin Britta Bastian, las Habel markante Absätze aus seinem Lexikon vor, in dem auch mehrere Seiten Dean Reeds DEFA-Filmen gewidmet sind. Gegenüber der Erstausgabe von 2001 ist das nunmehr zweibändige Lexikon um etwa 100 Filme erweitert worden, weil auch Fernsehproduktionen, die im Kino liefen, sowie Filme aus der BRD und der Sowjetunion hinzukamen, die zwar formal keine DEFA-Streifen waren, aber zu beachtlichen Teilen von der DEFA unterstützt wurden. Autor F.-B. Habel beim signieren seines Werkes. Im Publikumsgespräch wurde der Autor nach dem Verhältnis zwischen der DEFA als Produzenten und den Künstlern gefragt. Habel erläuterte, dass die künstlerischen Auffassungen mitunter nicht mit den vorgegebenen gesellschaftlichen Interessen harmonierten und führte das Beispiel von Rainer Simons Film „Jadup und Boel“ (mit Katrin Knappe als Boel) an, der 1981 fertiggestellt wurde, aber wegen zu kritischer Schilderung der Gegenwart bis 1988 (ein bisschen Glasnost war auch in der DDR angekommen) warten musste, ehe er aufgeführt werden durfte. In der DDR, so Habel, war der Staat zugleich der Produzent, denn die DEFA war ein Volkseigener Betrieb. Habel zitierte aus seinen Gesprächen mit dem renommierten Regisseur Egon Günther, der die DDR 1980 verließ, um für zehn Jahre im Westen zu arbeiten, und der desillusioniert zurückkehrte. Sinngemäß hatte Günther gesagt, in der DDR konnte man mit den Funktionären, die die Filme anders haben wollten, wenigstens darüber diskutieren. Produzenten im Westen diktierten, wie die Filme auszusehen hätten, rein nach Marktinteressen und da war mit ihnen nicht zu reden. 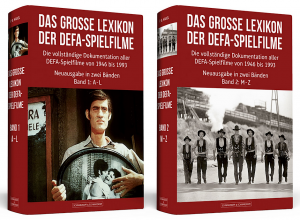 Die erweiterte Neuausgabe in zwei Bänden dokumentiert alle Filme der DEFA aus 47 Produktionsjahren (1946 bis 1993). Geboten werden jeweils eine Auflistung der Mitarbeiter, eine Inhaltsangabe, Anmerkungen zur Rezeptionsgeschichte sowie zahlreiche Abbildungen. Nirgendwo sonst lässt sich kollektives Erleben besser nachempfinden und kaum eine andere Kunstform gibt mehr Sichten auf den Alltag der Menschen frei, als der Film. Das gilt in besonderem Maße für die DEFA-Produktionen als ein Stück Deutscher Geschichte, wie sie im neuen, erweiterten Lexikon erzählt wird. Mit dabei sind auch die 22 Produktionen die im „DDR-Volksmund“ als „Kellerfilme“ und später auch als „Kaninchenfilme“ bezeichnet wurden. Dabei handelt es sich um Filme, die der SED (Sozialistische Einheitspartei Deutschlands) zur Zeit des Erscheinens und später nicht genehm waren und durch das Plenum des ZK der SED und weitere auf anderen Wegen, verboten wurden. Gute und schlechte Produktionen, die teilweise erst nach der Auflösung der DDR der Öffentlichkeit vorgestellt wurden. Auch Spiel- und Dokumentarfilme wie „Der Untertan“ (1951), „Du und mancher Kamerad“ (1956), „Thomas Müntzer“ (1956), „Das tapfere Schneiderlein“ (1956) und „Berlin – Ecke Schönhauser“ (1957), die neben Anderen der Zensur in der BRD (Bundesrepublik Deutschland) zum Opfer fielen, sind dabei. Ein obskurer „Interministerieller Ausschuss für Ost/West-Filmfragen“ hatte seine Einfuhr verboten. Ebenso sind die beliebten DEFA-Märchenfilme, über deren sozialistisch-pädagogische Wertigkeit sich sicherlich streiten lässt, mit über dreißig Produktionen ausführlich beschrieben. Wer sich mit der DDR-Filmgeschichte beschäftigt, sei es nun beruflich oder aus rein privatem Interesse, kommt um dieses Standartwerk nicht herum. Sauer aufstoßen wird er aber an der Kasse seiner Buchhandlung oder Onlinebuchhandlung, wenn’s ans bezahlen geht. Ganze 99,99 Euro muss man ausgeben um die erweiterte Ausgabe sein Eigentum nennen zu dürfen. Bei dem Preis ist zu hoffen das viele öffentliche Büchereien, soweit sie noch nicht wegrationalisiert wurden, sich dieses umfassende Werk anschaffen. Nirgendwo sonst lässt sich kollektives Erleben besser nachempfinden und kaum eine andere Kunstform gibt mehr Sichten auf den Alltag der Menschen frei. US-Präsident Trump lässt keine Gelegenheit aus, um neue Kriegsbrände in Gang zu setzen, ob mit seinem Drohungen eines Atomschlages gegen die Demokratische Volksrepublik Korea oder aktuell mit seiner Anerkennung Jerusalems als Hauptstadt Israels. Er schüttet immer wieder Öl ins Feuer. Seine Anerkennung Jerusalems als Hauptstadt Israels verstößt gegen das Völkerrecht. Selbst bürgerliche Regierungen wie die deutsche Bundesregierung oder die britische sagen das. Nach dem Sieg über den Hitlerfaschismus sollte Palästina, das unter UN-Mandat stand, nach dem Willen der Völkergemeinschaft zu einem Staat werden, in dem alle Nationalitäten und Religionen friedlich zusammenleben. Mit der Gründung Israels wurde dieser friedliche Weg verlassen. 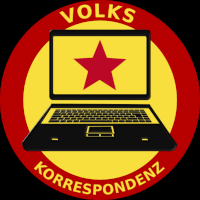 Die UdSSR akzeptierte das, um einen neuen Weltbrand zu vermeiden. Mit Unterstützung des US-Imperialismus, der immer Geld und Waffen geliefert hat, wurde Israel zu einem Stützpunkt des westlichen Imperialismus ausgebaut. Das bedeutete ein rassistischer Staat, der die Palästinenser vertrieb und unterdrückte, ihnen ihr Land nahm. Mit der orthodoxen Siedlerbewegung wurde ein reaktionäres Instrument geschaffen, um auch in den besetzten Gebieten im Westjordan immer mehr palästinensisches Land zu okkupieren. Israelische Politik findet nur noch mit dem Bajonett statt. Wir sind keine Antisemiten! Wir machen einen Unterschied zwischen der jüdischen Religion und den Zionismus, der die rassistische Staatsdoktrin Israels ist. Viele Juden sind gegen diese Politik und für ein friedliches Zusammenleben aller Religionen und Nationalitäten. Die Politik des israelischen Staates, der sich immer mehr zum langen Arm des Imperialismus in dieser ölreichen Region macht und hilft, die Staaten der Region in Schach zu halten, ist für die Menschen in Israel hochgefährlich, da es zu einem permanenten Kriegszustand geführt hat. Gefährlich ist allerdings auch die Politik der Bundesregierung, die zwar Trumps Entscheidung kritisiert, aber keine ernsthaften Konsequenzen zieht. Sie liefert Waffen in die Türkei, an Saudi-Arabien, an Israel usw. – mitten in diese brandgefährliche Region. Sie hat deutsche Soldaten nach Syrien und in den Irak geschickt sowie Marineeinheiten am Horn von Afrika – ebenfalls mittendrin. Damit wird unser Land in diesen Konflikt, der sehr wohl das Potential zu einem großen Krieg hat, hineingezogen. Und die Bundesregierung weigert sich, Palästina als Staat anzuerkennen. Das jedoch ist gerecht. Denn die Palästinenser haben ein Recht auf einen eigenen Staat, auf Selbstbestimmung und den Abzug der israelischen Besatzungstruppen. 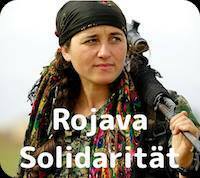 Keine Waffenexporte an Israel, Türkei, Saudi-Arabien usw.! Abzug aller Bundeswehrtruppen aus dem Ausland! 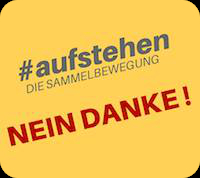 Anerkennung des palästinensischen Staates und des Selbstbestimmungsrechtes des palästinensischen Volkes! Erstveröffentlichung am 8. Dezember 2017 in Arbeit Zukunft online. Veröffentlichung mit freundlicher Genehmigung des Herausgebers. 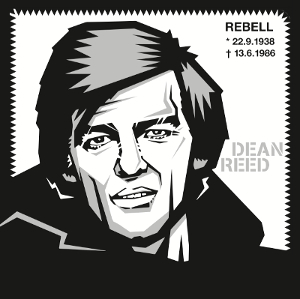 Bilder und Bildunterschriften wurden von der Redaktion American Rebel hinzugefügt. Am Fall „Emmely“ erkläre ich heute die arbeitsrechtliche Lage bei Bagatellkündigungen. Wichtig ist das Arbeitenehmer/innen niemals etwas unterschreiben was ihm/ihr von einem Arbeitgeber vorgelegt wird. Dazu gibt es keine rechtliche Verpflichtung. Sie schwenken Fahnen mit der Friedenstaube, singen die Internationale und verleihen Preise mit Karl-Marx-Kopf. Was sie ausmacht ist die Auffassung das rechts und links sich nicht grundsätzlich widersprechen und die Klassifizierung „rechts und links“ von den Herrschenden erfunden wurde, um das Volk zu spalten. Dieses und mehr saugen die Fans des „Pseudo-Linkspopulisten“ Ken Jebsen in leicht konsumierbarer Form auf und bezeichnen ihn als Verteidiger der Meinungsfreiheit. Auf der Suche nach Artikeln über diese neue Form der alten Querfrontideologie bin ich auf einen Artikel von Daniel Bratanovic und Sebastian Carlens gestoßen, der am 14. Dezember 2017 in der Tageszeitung Junge Welt (JW) veröffentlicht wurde. Da ich, obwohl ich nicht alles teile was dort erwähnt wird, diesen Artikel für sehr informativ halte und weil eine Verlinkung mit „JW“ nicht dauerhaft zum Artikel führen muss, möchte ich den Inhalt an dieser Stelle in Teilen wiedergeben und den Leser/innen von AR empfehlen. Ein Blog, der Texte Donald Trumps verbreitet, den Unfalltod des österreichischen Rechtspolitikers Jörg Haider für ein Mossad-Attentat und die Mordserie des »NSU« für ein Komplott unter »Beteiligung von Geheimdiensten der Siegermächte« hält, möchte einem »alternativen Journalisten« einen selbstgestifteten Medienpreis überreichen. Ist das eine Meldung wert? Für die Fans des so Ausgezeichneten vielleicht, ansonsten wohl eher nicht. Die Verleihung eines »Kölner Karlspreises« an den ehemaligen RBB-Moderator Ken Jebsen, die der Blog mit dem anmaßenden Namen Neue Rheinische Zeitung (NRhZ) am Donnerstag in Berlin vornehmen will, wird erst zum Politikum gemacht. Denn nachdem der Berliner Kultursenator Klaus Lederer (Die Linke) in einem Akt der Anmaßung auf Facebook gegen die Veranstaltung, die im städtisch geförderten »Kino Babylon« stattfinden soll, protestiert hatte, ist aus der Berliner Lokalposse ein handfester Streit innerhalb der Partei Die Linke geworden. Der ehemalige Bundestagsabgeordnete Wolfgang Gehrcke beklagt »Zensur« und ruft nach Kündigung der Kinoräume für NRhZ (die mittlerweile nach einer einstweiligen Verfügung wieder aufgehoben worden sein soll) zu einer Protestkundgebung auf. Diese soll am heutigen 14. Dezember vor dem »Kino Babylon«, aber auch vor dem benachbarten Sitz der Linkspartei, dem Karl-Liebknecht-Haus, stattfinden. Oskar Lafontaine meldete sich am 6. Dezember ebenfalls via Facebook zu Wort, um zu fragen: »Wen hat Ken Jebsen umgebracht?« Weshalb, fragt der ehemalige Parteivorsitzende, solidarisiert sich der Vorstand der Linken mehrheitlich mit Lederers Kritik an Jebsen, der doch offenkundig kein Schwerverbrecher oder dergleichen ist? »Das ist eine bedenkliche Entwicklung«, so Lafontaine. Doch nicht nur Kritik an Jebsens Positionen bringt seine Anhänger auf den Plan. 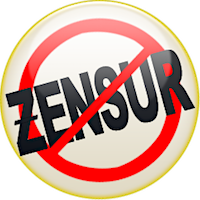 »Solidarität mit Ken Jebsen!« fordert der Publizist Andreas Wehr auf seiner Webseite. Der jungen Welt unterstellt er in diesem Zuge »beispielloses Versagen«, nicht etwa weil sie die Raumkündigung gegen NRhZ und Jebsen für gut befunden hätte, sondern weil sie zu diesem Zeitpunkt noch gar nichts über die etwas provinzielle Berliner Geschichte veröffentlicht hatte. Von Politikern wie Wehr, immerhin – laut eigener Auskunft im Internet – früherer Leiter des Büros des damaligen Westberliner Bürgermeisters Walter Momper (SPD), ist anzunehmen, dass sie sich nicht unbesehen für jemanden verwenden, dessen Ansichten sie nicht kennen und teilen. Was für ein »ideologischer Kampf«, welcher »Kampf um die Sprache« wird von Jebsen und seinen Freunden geführt? Wofür steht das Medienprojekt KenFM, das Verbündete bis in den Funktionärsapparat der Linkspartei hinein findet? Der Unterschied zwischen Faschisten und Antifaschisten ist demzufolge also ein rein konstruierter, um – wen – zu spalten? Die Bevölkerung eines besetzten Landes, Deutschlands. Denn auch die These vom »Vasallenstaat« BRD findet sich bei Jebsen. Noch 2013, bevor er seine öffentlichkeitswirksame Zusammenarbeit mit Jürgen Elsässer einstellte, trat Jebsen gemeinsam mit dem schon damals deutlich erkennbar rechtsgewendeten Blattmacher bei »Compact live« zum Thema »Big Brother USA hält Deutschland besetzt« auf. Im April 2014, immerhin ausdrücklich als Reaktion auf die ihm vielfältig entgegengebrachte Kritik, verkündete er dann: »Sie behaupten, ich würde für Compact schreiben. Falsch. Ich schreibe für KenFM. Nur, Compact übernimmt den ein oder anderen Text. Unverändert. Exakt derselbe Beitrag erscheint dann aber auch beim Kritischen Netzwerk oder der NRhZ. 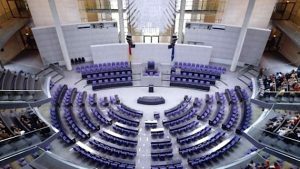 Fällt Ihnen auf, dass es sich hier um ziemlich linke Medien handelt, während Compact eher im konservativen Raum zu verorten ist? Mir geht es um Reichweite. Ich will, dass beide ›Lager‹ (Linke und Rechte, Anm. d. Red.) erkennen, dass sie extreme Schnittmengen haben. Um miteinander zu arbeiten, nicht gegeneinander, und diese überschüssige Energie positiv nutzen können« (im Ken-FM-Video »Klarstellungen zu den Friedensmahnwachen«). Ins selbe Horn stieß im gleichen Monat bei einer Berliner »Montagsmahnwache« auch Elsässer, der ebenfalls die Kategorien rechts und links für überholt erklärte und zur Bildung einer »Querfront« aufrief. Elsässer selbst hat lange schon einen anderen Weg eingeschlagen und sich mit der offenen Rechten verbündet, doch objektiv ist Jebsens wiederholte Behauptung, es gebe keine Rechten und Linken mehr, genau das, was Elsässer damals vorschlug: Übertölpelung von Linken, um sie mit Rechten zusammenzuführen. Häufig ist von seiten seiner Verteidiger zu hören, die Vorwürfe gegen Jebsen seien »erfunden«, »erlogen« oder »konstruiert«. Das Internet, Jebsens Medium, ist schnellebig. In seinem Austrittsschreiben hat Veeser indes dort getätigte Äußerungen des KenFM-Betreibers umfangreich aufgelistet. Sie sollen nach seinem Dafürhalten verdeutlichen, warum sich für Aufklärer und Antifaschisten, Verteidiger der Vernunft und Kämpfer für die Wahrheit eine Zusammenarbeit mit einem solchen Manne verbietet. Diese Hinweise wollen wir an dieser Stelle, redaktionell ergänzt, verfügbar machen. Das von Ken Jebsen betriebene Medienportal KenFM bezeichnet sich in seiner Eigendarstellung (»Über KenFM«) als »medialer Mülltrenner«. Auf der Seite schreiben unterschiedliche Autoren in vielfältigen Formaten. Einzelne Artikel vertreten gelegentlich linke, andere rechte Standpunkte. So wird einerseits über die Oktoberrevolution, die sich unlängst jährte, geraunt, es habe sich um eine von fremden Geheimdiensten eingefädelte »gewaltsame Machtergreifung einer Minderheit« gehandelt, deren Ziel ein »immer ausschweifenderes Luxusleben« einer »machthabenden Funktionärskaste« gewesen sei (»Tagesdosis 4.11.2017: Die Russische Revolution 1917«). 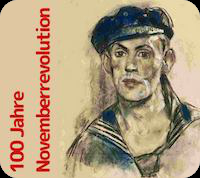 Wenige Tage später erscheint ein gegenteiliger Kommentar, der auf den sozialen Charakter der Revolution verweist (»Tagesdosis 6.11.2017: Revolution und Konterrevolution«). Dieser objektivistische Standpunkt, den sich KenFM zu eigen macht, unterscheidet sich zunächst nicht grundsätzlich vom Herangehen etablierter bürgerlicher Medien. Doch für KenFM spricht vor allem eine Person, nämlich Gründer und Betreiber Jebsen selbst. Sein Konterfei in Großaufnahme ist auf der Startseite des Portals gleich vielfach zu sehen, sein Vorname taucht in vielfacher Variation auf. Sein Prinzip des »Mülltrenners« erklärt Jebsen so: »Die Schuldigen sind die Medien (…), schaut diesen Müll nicht noch. Das müsst ihr auch gar nicht. Ich schau’ diesen Müll und verarbeite das in ›Me, myself and Medien‹ (eine Internetsendung Jebsens, Anm. d. Red.). Das reicht, mehr müsst ihr gar nicht gucken.« (Auftritt auf der Berliner »Montagsmahnwache« am 16.3.2015). Dieser überhebliche Gestus eines Gurus, der seinem Publikum vom Gebrauch des eigenen Kopfes ausdrücklich abrät und es statt dessen anhält, die Welt nur noch durch die eigene Brille gefiltert wahrzunehmen, durchzieht die ganze Webseite. Durch die Omnipräsenz des Gründers, Machers und Namensgebers müssen Jebsens eigene Äußerungen auf KenFM als programmatisch verstanden werden. Was also »ist dran am ›Phänomen Ken Jebsen‹?« (so eine rhetorische Frage Jebsens an sich selbst). Der Medienmacher gefällt sich in der Rolle des Provokateurs – gegen die etablierte bürgerliche Konkurrenz, gegen Linke und den Parlamentarismus. Auf der bereits erwähnten »Mahnwache« im März 2015 erklärte er die »sogenannte linke Presse« zum »Feind in diesem Land«. Es scheint also doch Linke zu geben – zumindest wenn Jebsen mit ihren Meinungen nicht einverstanden ist. Kritik an Rechten steht hingegen nie auf seinem Sendeplan – auch nicht, wenn er sie als Studiogäste zum Interview begrüßt. Der Autor des rechtsesoterischen Kopp-Verlags Gerhard Wisnewski konnte etwa im März 2017 auf KenFM behaupten, die »Flüchtlingskrise« sei im Interesse der »Desorganisation Deutschlands« bewusst herbeigeführt worden, mit »massenhaft Migrantenkindern«, die nicht »lernbereit« seien. Widerspricht Jebsen, hakt er kritisch nach? Fehlanzeige. Zwar ist es Jebsen nicht gelungen, 25.000 Menschen zusammenzubringen (am 1.10.2016 demonstrierten rund 1.500 Personen vor dem Berliner Kanzleramt, neben Jebsens Anhängern zeitgleich noch eine zweite Gruppierung, die »Friedensfahrer Berlin-Moskau«). Doch anderswo war der vermeintliche Umsturz erfolgreicher: »Freunde, heute ist ein guter Tag«, frohlockte Jebsen am 14. November 2016 anlässlich der Wahl Donald Trumps zum US-Präsidenten in seiner Sendereihe »nachdenKEN«. »Als ich heute morgen das gehört habe, ich habe die halbe Nacht wach gelegen und sah, dass sich die Prognose so abzeichnete, wie ich mir das gewünscht habe, habe ich gedacht: ja! Endlich stehe ich mal hinter einem amerikanischen Präsidenten.« Nicht nur hierin ist er mit der NRhZ, die ihn nun auszeichnen möchte, einer Meinung. Dort firmiert Trump »als Hoffnungsschimmer für Amerika und die Welt«. Auch die Verfasser eines Jubelartikels auf den damals frisch gewählten US-Präsidenten (er »wird die Welt positiv verändern«), den KenFM kurz nach der Wahl in Zweitverwertung veröffentlichte, wusste schon damals genau, was der Machtwechsel in Washington bringen wird: »Deshalb wird Trump in seinem zukünftigen politischen Leben reifen. Politik und Verwaltung Amerikas werden stabil weiterlaufen. 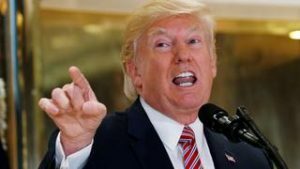 Veränderungen und Erneuerungen werden kommen, und das ohne Chaos.« Der Text stammt aus der Redaktion der Epoch Times (KenFM, 13.11.2016: »Trumps Sieg eröffnet der Welt eine neue Ära«). Die Epoch Times, früher Die Neue Epoche, ist ein auf deutsch und chinesisch erscheinendes Organ aus dem Umfeld der in China verbotenen Psychosekte »Falun Gong«. Das Blatt hat allerdings vor wenigen Jahren eine ganz erstaunliche Kehrtwende vollzogen: Anfänglich vor allem der Hetze gegen die Volksrepublik China verpflichtet, bläst das zumindest früher in hoher Auflage gedruckte Medium seit Beginn der sogenannten Flüchtlingskrise auch unverhohlen ins Horn von Pegida und AfD – und von KenFM. Als »bahnbrechende Rede gegen Angst und Hysterie« feierte die Epoch Times beispielsweise am 9. November 2015 Jebsens bereits zitierten Auftritt vor »Wir sind Deutschland« in Plauen: »Selten war eine seiner Reden so geeignet, seinen politischen Standpunkt klarzustellen, wie diese Rede über seine und unser aller Wahrhaftigkeit.« Eine ausgesprochen merkwürdige Allianz, zumal bis heute wenig über die organisatorischen und finanziellen Hintergründe der Epoch Times und des illustren deutsch-chinesischen »Dissidentenmilieus« in der BRD bekannt ist. Der Freude über die Wahl Donald Trumps zum US-Präsidenten liegt eine spezifische und bemerkenswert banale Annahme über die Art und Weise zugrunde, wie die US-Gesellschaft angeblich funktioniert. Demgemäß hätten in den Vereinigten Staaten bisher Hintermänner mit sinistren Absichten die Strippen gezogen. In einem Audioclip vom Frühjahr 2012 lässt sich nachhören, welche Hintermänner das sein sollen. Nun wird der Vorwurf, dass Jebsen ein Antisemit ist, von seinen Verteidigern brüsk zurückgewiesen. Dies sei wie so oft das übliche Pauschalurteil, um Kritiker mundtot zu machen, sei Rufmord. Doch der Inhalt dieses knapp einstündigen Audioclips mit dem Titel »Zionistischer Rassismus« lässt von Anfang bis Ende eine antisemitische Webart erkennen: von der Unterstellung, Juden kontrollierten in den USA vermöge ihres Reichtums Politik und Medien, über die Gleichsetzung von Zionismus und Nazismus bis hin zur Relativierung des Holocaust. Die folgenden Zitate sind dem genannten Clip entnommen. Jebsen scheint besessen von dem Gedanken, »die Zionisten« begingen Greueltaten, die jene der Nazis noch überträfen. Minute 14:59: »Das gemeinsame Hobby dieser Zio-Cons ist die Schaffung eines israelischen Großreichs, konkret: ein Israel ohne Palästinenser. 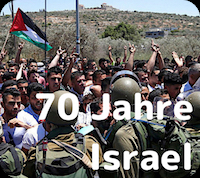 (…) Ins Altdeutsch übersetzt: Israel strebt in Palästina die Endlösung an, klassischer Genozid.« Minute 27:24: »Zionismus ist, in seiner ganzen Radikalität zu Ende gedacht, ziemlich identisch mit der Rassenideologie der Nationalsozialisten.« Die »Holocaustindustrie« der »proisraelischen Lobby« besitze »die Copyright-Rechte« am Begriff und erkläre »permanent, dass der Holocaust unique sei, einmalig, mit nichts zu vergleichen, ein absolutes Novum in der Geschichte der Menschheit, für immer und ewig, wie der Urknall. Dem wagt kaum einer zu widersprechen. Das einzige, was am Holocaust der Nazis einmalig ist, ist sein Datum« (ab Minute 31:00). Von dieser Feststellung ausgehend, gelangt Jebsen zu weiteren Befunden. Minute 33:00: »Doch ebenfalls, noch bevor Adolf Hitler mit seiner Endlösung angefangen hatte, kam es in der UdSSR zu einem Holocaust. 1933 ließen die Russen innerhalb eines Jahres sieben Millionen Ukrainer vorsätzlich verhungern (…). Auschwitz war also eine Wiederholung und rutscht damit in den Holocaust-Charts auf Platz zwei.« Und mit Blick auf den Landraub in Nordamerika und den Massenmord an den Native Americans, begangen von den weißen Siedlern, »rutscht« nach Jebsens apodiktischem Urteil »der Holocaust der Nazis in der Unterdisziplin Raub ebenfalls auf Platz zwei der größten Verbrechen der Menschheit« (Minute 36:00). Vom Wirken der »Zionisten« steht, zu diesem Schluss gelangt der ehemalige Radiomoderator, Schlimmeres zu erwarten als das, was die Nazis getan haben: Wenn der Politik Israels nicht bald Einhalt geboten werde, heißt es abschließend, »wird es bald kein palästinensisches Volk in Palästina mehr geben. Was Adolf Hitler während der Schoah mit den Juden nicht gelungen ist, hätten radikale Zionisten mit den Palästinensern dann erreicht: die Endlösung« (Minute 56:03). Dieser gesteigerte Wahn war selbst treuesten Verbündeten unangenehm – zumindest im Hinblick auf eine weitere politische Verwendbarkeit Jebsens. In der Sendung »KenFM im Gespräch« vom Mai 2014 belehrt der frühere ATTAC-Aktivist Pedram Shahyar seinen Mitstreiter, dass Relativierungen und Nazivergleiche unstatthaft seien. Jebsen zeigt sich reuig: »Das war falsch, da sag’ ich sorry. Aber das war Absicht.« Anerkannt wird eine überzogene Emotionalität, zurückgenommen die Methode der »Kritik«, bedauert die verfehlte Wirkung, nicht aber der Inhalt und das, worauf dieser vorgelesene Text verweist: Auf ein geschlossen antisemitisches Weltbild. Shahyar genügte damals die inszenierte Entschuldigung. Und im Zweifel will Jebsen das alles auch gar nicht gesagt haben. Das Tondokument jedenfalls ist bei KenFM nicht mehr zu finden, und Journalisten von »Spiegel TV« beschied er im Dezember 2014, auf Passagen aus »Zionistischer Rassismus« angesprochen, mit den Worten: »Habe ich nicht vorgetragen«. Das ist eine bekannte Masche. Auch sein Bekenntnis zu Trump vom November 2016 wollte er eine Woche später so nicht gemeint haben: Da sei »sehr viel Sponteinität und schauspielerische theatralische Dynamik« gewesen. Dies alles sollte man wissen, bevor man sich für Jebsen in die Bresche wirft – und man sollte annehmen, dass es diejenigen wissen, die es trotzdem für geboten halten, ihn zu verteidigen. Es gilt weniger, den Blick auf Jebsen zu richten, der als politischer Selbstvermarkter unterwegs ist und sich dementsprechend – als »kleiner Selbständiger« – zielgruppenopportunistisch verhält. Wichtiger ist die Frage, welche Richtung diejenigen Kräfte einschlagen wollen, die Jebsen vehement gegen jede Kritik verteidigen. Manche von ihnen haben sich schließlich früher in der politischen Linken verortet. Ein einmaliger Ausrutscher waren die Vergleiche zwischen Nazis und Zionisten ohnehin nicht, wie sich etwa in dem Audioclip »Kai-ROH!« vom Januar 2014 nachhören lässt. Auch das liegt beinahe vier Jahre zurück, Läuterung wäre also nicht ausgeschlossen. Was aber ist davon zu halten, dass in der Rubrik »Ken FM am Set« ein Vortrag des in Israel geborenen und derzeit in England lebenden Jazzmusikers Gilad Atzmon unkommentiert gezeigt wird? Von dem stammen unter anderem solche Sätze: »Die Todesmärsche der Nazis waren eigentlich human«. Ein Auftritt Atzmons wird bei der Verleihung des von der NRhZ ausgelobten Preises für Ken Jebsen Teil des Kulturprogramms sein. (…). Als die Abrafaxe vor knapp 20 Jahren im 500. Mosaik-Heft ihren Vorgängern, den Digedags, zum ersten und bisher einzigen Mal begegneten, wurde im Team die Frage gestellt, wer die Veteranen zeichnen solle, die Wahl fiel natürlich auf Lona Rietschel. 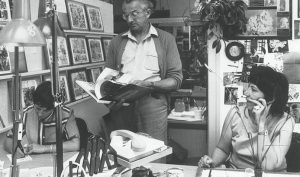 Jetzt sind die Abrafaxe, seit über 40 Jahren Helden von jungen und alten Lesern des Comic-Magazins Mosaik, zu Waisen geworden. Ihr »Vater« Lothar Dräger ging im vergangenen Jahr von uns, nun hat auch die »Mutter« der drei Gnome ihre Augen für immer geschlossen. Mit 84 Jahren erlag sie am Dienstag einer Krebserkrankung. Seit 1960 gehörten Rietschel und Dräger zum Mosaik-Kollektiv, der Truppe von Machern der Monatszeitschrift, die noch im Verlag Junge Welt erschien. Dräger war der Autor, der sich als rechte Hand von Digedags-Erfinder Hannes Hegen Geschichten um die Zeitreisenden ausdachte; Rietschel, die ursprünglich Modezeichnerin hatte werden wollen, dann aber doch an einer Zeichentrickschule lernte, entwickelte sich zu der Zeichnerin, deren Schwung vielen Lesern am besten gefiel, auch wenn ihr Name damals noch nicht bekannt war. »Es gab da in jedem Mosaik so einige Seiten, die man sich besonders gerne anschaute, weil einfach alles stimmte – von vorne bis hinten … ›Der gute Zeichner‹ alias Lona war wieder am Werk gewesen. Lonas Strich war eben ein besonderer, stets schwungvoll und mit Leichtigkeit und selbst bei Bösewichten liebevoll«, heißt es im Nachruf der Mosaik-Redaktion. Rietschel wurde zunächst Spezialistin für Ritter Runkel, den Reisegefährten der Digedags. Hannes Hegens von vielen Geheimnissen umranktes Ausscheiden beim Mosaik im Jahr 1975 war für Rietschel, die ein gutes Verhältnis zu diesem Chef gehabt hatte, ein traumatisches Erlebnis. Es war wohl eine kleine Befriedigung für beide, dass sie Hegen, der sich jahrzehntelang verweigert hatte, am Ende seines Lebens aufsuchte und beide ihren Frieden miteinander machten. Dass allerdings vor zwei Jahren ein Filmessay nahelegte, die Mitarbeiter seien Hegen in den Rücken gefallen, empörte Rietschel. Nach seinem Weggang musste ein Ersatz für die Digedags gefunden werden. Das bewährte Konzept eines Trios, das durch Welt und Jahrhunderte reist, dort den Alltag erlebt und auch auf historische Personen trifft, sollte beibehalten werden. Dräger dachte sich die Abrafaxe aus und von den grafischen Entwürfen der Zeichnerinnen und Zeichner fand der von Rietschel am meisten Anklang. So wurden die beiden zu den »Eltern« der Abrafaxe. 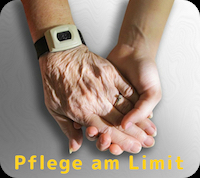 Dräger arbeitete bis 1990 für das Heft, Rietschel bis 1999 als künstlerische Leiterin, danach zeichnete sie immer wieder Titelbilder für Sonderausgaben. 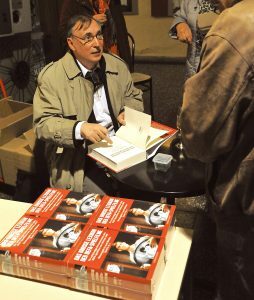 Auf Fantreffen in Berlin, Apolda und anderswo schuf sie kleine Zeichnungen und signierte ihr 2013 erschienenes Buch »Bilder meines Lebens«. Im gleichen Jahr wurde Rietschel auf dem Comic-Festival in München mit dem »Peng!«-Preis für ihr Lebenswerk ausgezeichnet, eine Ehrung, die vor ihr die westdeutschen Kollegen Rolf Kauka und Hansrudi Wäscher erhalten hatten. 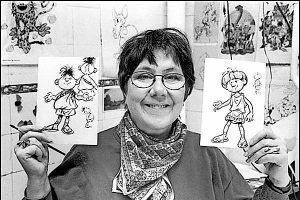 Lona Rietschel, die 1933 im heute polnischen Rzepin geboren wurde, hat auch anderweitig Spuren in der Öffentlichkeit hinterlassen. Gemeinsam mit ihrem vor fünf Jahren verstorbenen Mann, dem Grafiker Kurt Rietschel, gestaltete sie Werke für den Berliner Tierpark. Ein großes, witziges Wandbild von ihr in der Betriebskantine hat tatsächlich alle Umstrukturierungen überlebt. Abrax, Brabax und Califax sind bei den acht Zeichnern, die im Mosaik-Verlag Steinchen für Steinchen in Berlin-Westend heute an den Heften und Büchern arbeiten, in guten Händen. An Rietschels unprätentiösem, akkuratem Stil haben sich alle orientiert, und Redaktionsleiter Jörg Reuter, Rietschels Schwiegersohn, sorgt für Kontinuität bei den drei kleinen Kerlen. Erstveröffentlichung: Junge Welt, 21.12.2017, mit freundlicher Genehmigung des Autorss.